Back in November of last year, Mondo announced that they were developing a Jurassic Park board game at MondoCon in Austin, Texas. And now, we have our first look at the game, which is officially titled Jurassic Park: The Chaos Gene. In the asymmetrical miniatures tabletop game, players take control of a faction in the park and do whatever it takes to leave in one piece. Players will also have the option to be the dinosaurs. There currently is not an official release date, but one can imagine that the board game will be available in time for Christmas. Jurassic Park: The Chaos Gene features 4 factions for players to choose from. There's the InGen Corporation, Park Visitors, Raptors, and even the T-Rex. Each one of the miniature game pieces is incredibly detailed and up to the quality standards that one would expect from Mondo. The game allows 2 to 4 players and will all depend on skills to see if you eat or become eaten. Mondo Games Creative Director Luke Byers had this to say about the game. "In our approach to Jurassic Park: The Chaos Gene, we took many of our favorite elements of a traditional dungeon crawl style board game and spliced them with one of our favorite films of all time. The goal was to create something truly unique and incredibly fun to play." As for the Jurassic Park: The Chaos Gene factions, they all have different strengths and weaknesses. Depending on the faction chosen, the player will have a much different approach and experience than the rest of the players. The Tyrannosaurus Rex is quick and methodical, but not so quiet. The Raptors are cunning, resourceful, and flexible. Park Visitors are both in awe of the park and terrified by its destructive nature and InGen is desperate to keep the park functioning. While the release date for Jurassic Park: The Chaos Gene is currently unknown, Mondo will be on hand at San Diego Comic-Con next week and will have the game on display. Additionally, visitors to the Mondo booth will have the chance to grab a patch that corresponds to each of the four factions that players can choose in the game, while supplies last of course. It's easy to see by the look of the patches which factions will be the hot picks. The dinosaurs clearly have the upper hand in the design department, especially the T-Rex, which is the logo of the iconic 1993 movie. In other Jurassic Park news, Jurassic World: Fallen Kingdom is currently in theaters and has earned over $1 billion at the box office in less than a month. While the movie has been getting mixed reviews from fans of the franchise as well as critics, moviegoers are still going in droves to see the film, mostly overseas. So far, domestically, the sequel has only brought in $341.6 million, with the worldwide take totaling $727.6 million. 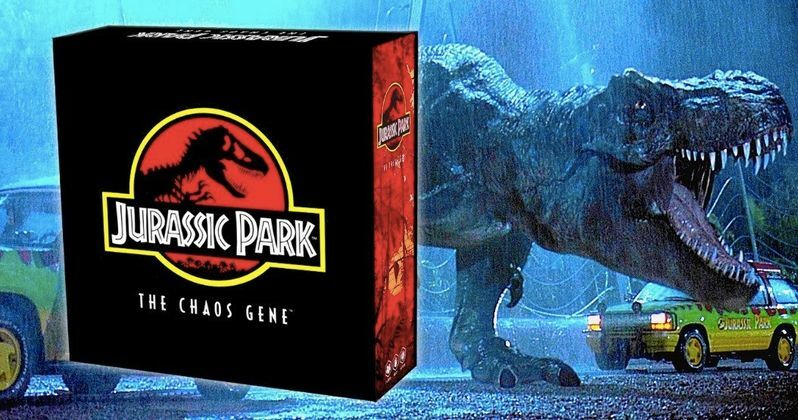 Jurassic Park: The Chaos Gene looks like a must-have for any huge fan of the franchise and news about a release date from Mondo is expected to be announced soon, although it's a safe bet that the board game could end up under the Christmas tree for some lucky individuals. It also not clear how much the set will cost, but it will probably be $60 for a standard edition and then $120 for a deluxe limited edition variant. While we wait for more information, you can keep a close eye on the Chaos Gene site for pre-order information.